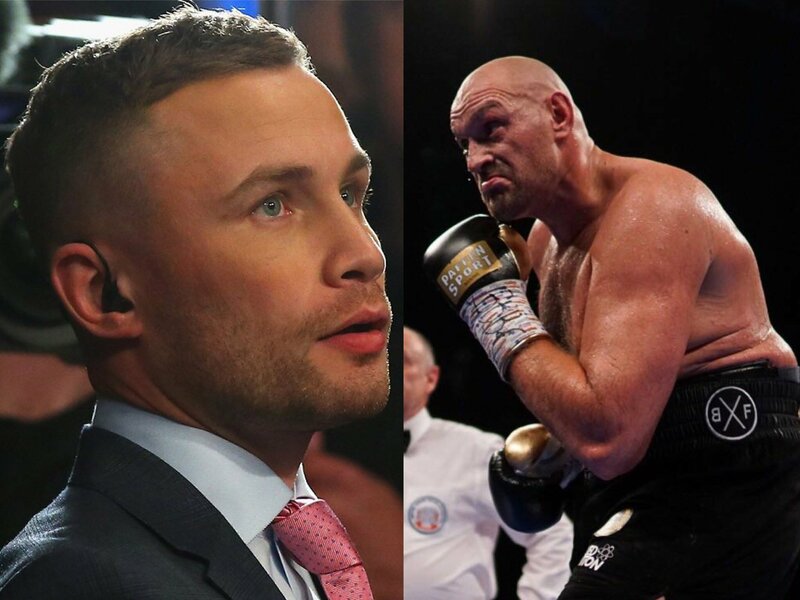 Frampton vs Jackson; Barnes vs Rosales & Tyson Fury: Tickets On Sale Now! Carl Frampton will defend his ‘interim’ WBO world featherweight title against unbeaten Australian Luke Jackson at Windsor Park, Belfast on Saturday August 18, fulﬁlling a dream to ﬁght at the famous football stadium. Lineal World Heavyweight Champion Tyson Fury will box a non-title ten rounder in his second comeback ﬁght on a mission to conquer the world once again. Paddy Barnes will challenge for the WBC World Flyweight title in just his sixth professional contest when he faces champion Cristofer Rosales. The Nicaraguan will be making the ﬁrst defence of his title he captured in April with a stunning upset win against Daigo Higa. Promoter Frank Warren today announced the stunning bill that will televised live on BT Sport at a packed press conference held at Windsor Park. Tickets on sale Friday from www.ticketmaster.ie. Price at £40, £50, £80, £100, £120, £150, £250, £400 (includes hospitality). “I thought last year Windsor Park had passed but Frank and the Irish Football Association have done a great job. “I come here and watch the football team and the atmosphere cannot be beaten anywhere in the world. Its like 80,000 fans giving you support. “I respect any opponent especially when they are coming to Windsor Park. “There are bigger ﬁghts but I cannot overlook Luke. Windsor Park need me to put on a big performance. “Luke is an Olympian, an undefeated ﬁghter and this can change his life if he beats me in a ﬁght of this magnitude. “I’m a fan of Carl and he is humble. He is very good and I am going to have to be at my best. “Carl doesn’t do anything great, but he is fundamentally sound and I am here to win. I am not here by luck. “I roomed with Jeff Horn at London 2012 and to see him beat Manny Pacquiao gives me hope and I have this massive opportunity. “Seferi was 23-1 but as soon as I clipped him he didn’t want to know. I can’t complain. I am still good looking. Two-weight world champion Carl Frampton will fight at Windsor Park on August 18 on a card that will also feature lineal heavyweight king Tyson Fury. Frampton (25-1-KO14) currently holds the interim WBO world featherweight title after outclassing Nonito Donaire at Belfast’s SSE Arena in April and will return at one his city’s major stadiums. Joining ‘The Jackal’ on a high-profile card will be unbeaten heavyweight Fury (26-0-KO19), who shrugged off two-and-a-half years out of the ring with a four-round stoppage of Sefer Seferi on June 9. Frampton said: “It means the world to me. It’s something I’ve dreamed about for a long time. I feel it should’ve happened last year but it’s happening now. “I’d rather it was a world title but nobody’s to blame – all the champions have recently fought and Warrington beating Selby threw a spanner in the works because Selby would’ve taken the fight. “I’ve loads left. My last performance was the second best of my career after the first Leo Santa Cruz fight. I feel like I’m enjoying it more and while I’m still performing, I’ll do it as long as I can. You are here: Home / Boxing News / Frampton vs Jackson; Barnes vs Rosales & Tyson Fury: Tickets On Sale Now!